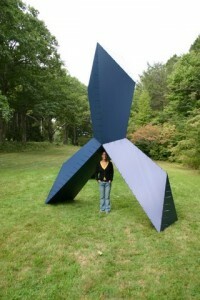 Permanent outdoor sculpture is big and expensive, so how do artists show new work without spending a fortune? This may not be an issue once your reputation and client list are golden, but meanwhile most artists make small maquettes for proposals. David Davies has been working on another solution. His two pieces in a recent sculpture show at the Pingree School in South Hamilton, MA made powerful statements about color and form, yet neither was as expensive as the same forms in steel or bronze would be. Still, an art patron or collector could easily see what kind of presence a permanent version of either would have. David’s first move to help visualize his sculpture when designing Synthetic Bond was to make a vector animation of it. His explanation of the form he intended: “The piece is constructed of 4 panels (polygons) which create 1 of the building blocks (polyhedron). 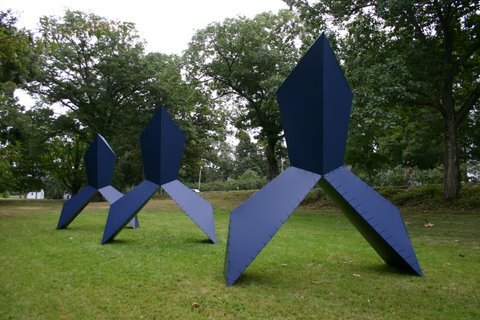 Each of the three sculpted forms are constructed of 4 of these polyhedrons.” Here one of the combined polyhedron units is shown in the animation he generated. Synthetic Bond is monumental. Each element is 11’ wide by 14.5’ tall and the three modules installed span 50’. It would be costly if fabricated of steel. Instead, David has constructed the three part sculpture of 4mm Coroplast, a plastic sign material, with 8” cable (zip) ties holding the panels together. He has made a stunning sculpture that functions as a life-sized maquette awaiting a patron. Rhythm Stick II is 12 feet tall and made of painted wood. Its iterations enliven the piece from all directions, reminding the viewer of orchestral jazz, the interactions of a busy community or the structure of a natural microcosm. If cast in bronze, Rhythm Stick II could sing forever. 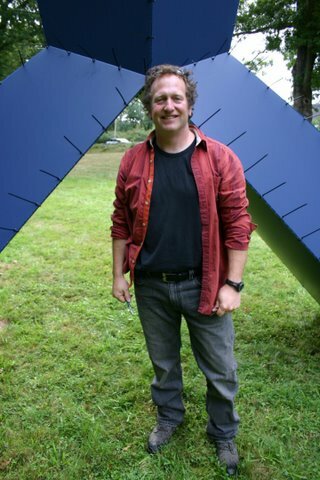 David Davies is one of the organizing artists for the annual Maudslay Outdoor Sculpture exhibit in Newburyport, MA. 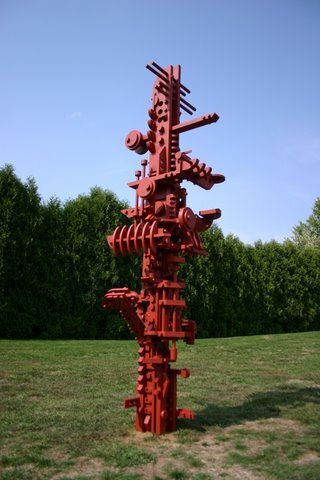 This entry was posted in process, reviews, sculpture and tagged contemporary art, David Davies, public sculpture, sculpture. Bookmark the permalink. Post a comment or leave a trackback: Trackback URL. Please, please, please, tell me you can put something in this year’s show at Pingree!